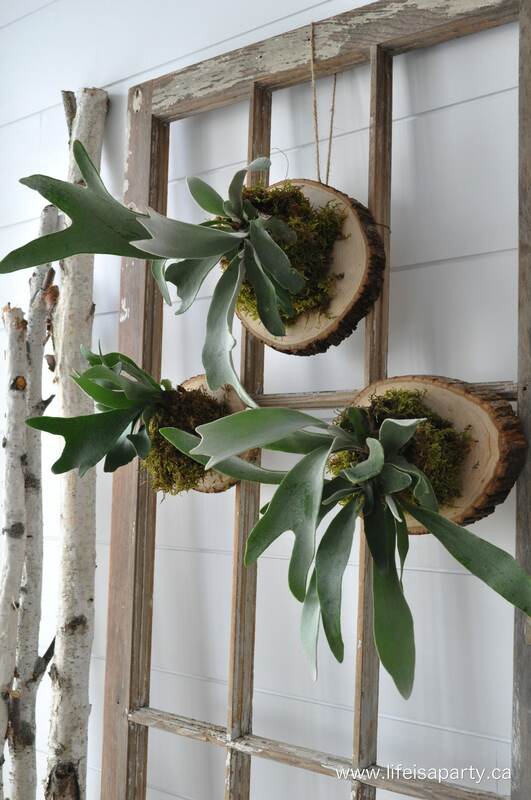 These mounted Stag Horn Ferns add a little green to any room, look great in a grouping, and are easy to make. 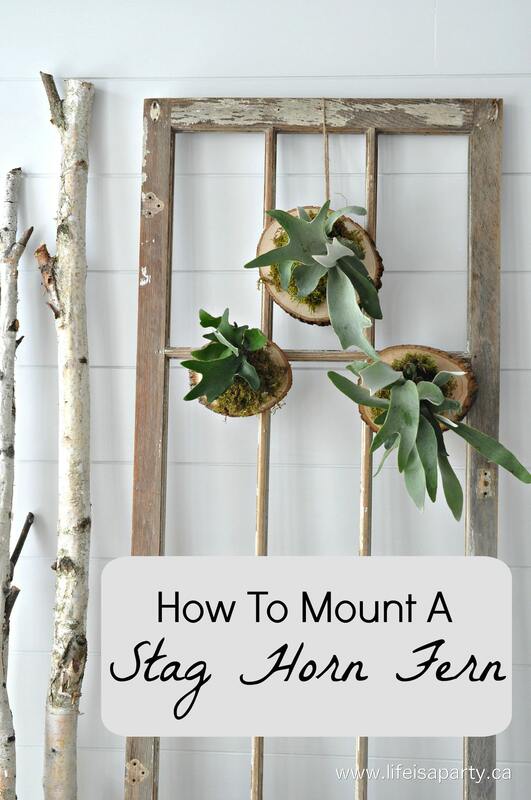 I made these for my Rustic Scandinavian Living Room Makeover Reveal last week -see it here if you missed it, and I wanted to share How To Mount a Stag Horn Fern. I think they add a rustic feel, and are a great way to create the feel of a deer head, in a more updated way. 1. These Stag Horn Ferns are called this because their beautiful fonds remind people of deer horns. They look great mounted on a wall and it’s easy to take them from potted plants to mounted ferns. 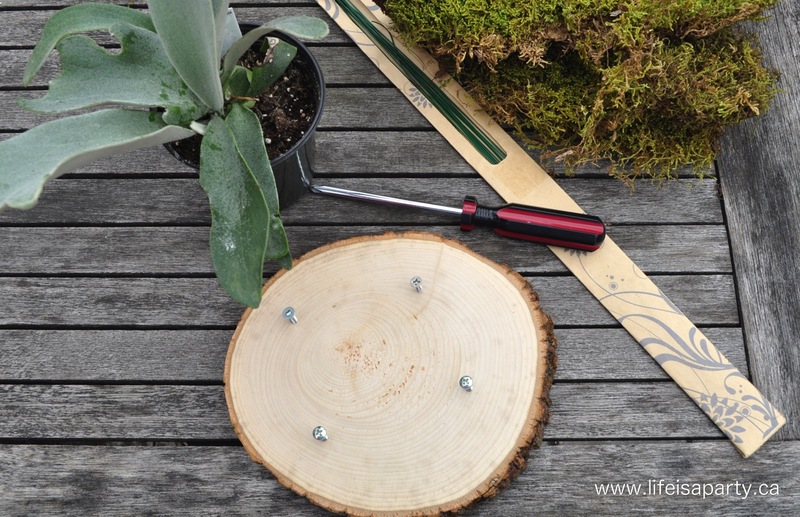 The first step is adding a hanger to the back of the wooden tree slice, so that you can easily hang it some where when you’re finished. I used a couple of picture hangers that screwed into the back. 2. Next, you want to add the screws to the front. These will hold the fern in place so you want them to be a little larger than the plant. 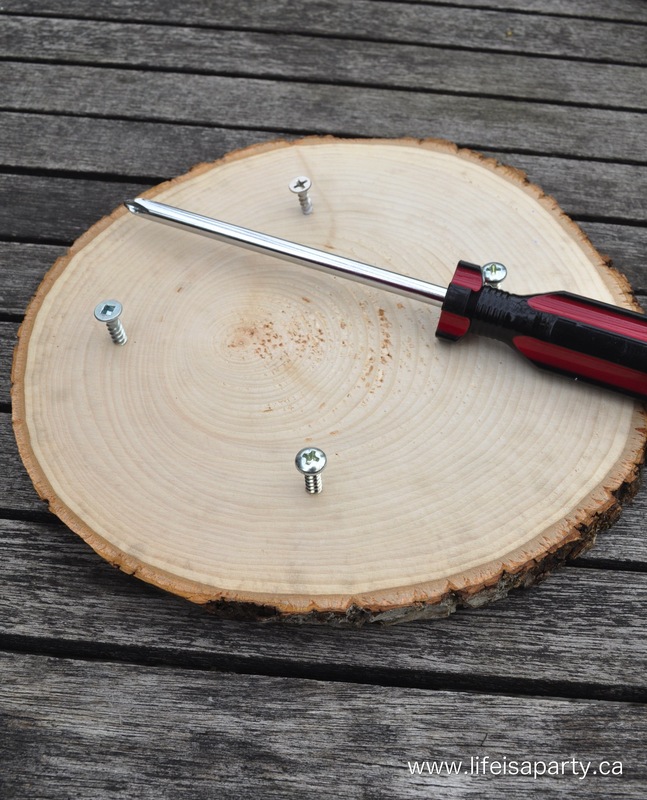 Screw them into the wood, but make sure about 1/2 inch is exposed, so you can wrap the wire around it easily. 3. Now remove the excess dirt from the roots of the stag head fern. 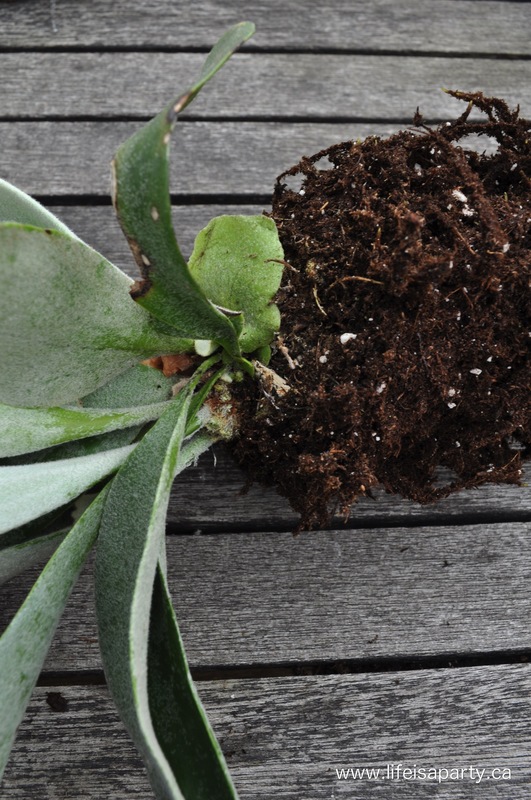 Use your fingers to gently pull away any extra dirt, without damaging the roots. 4. You must determine the top of the fern. Each plant will have a small rounded leaf at the top -this is the female part of the fern and fern will survive best of this leaf is at the top when it’s hanging. The fern has three kinds of leaves in total, the female rounded one, then the stag horn type ones that grow upward, and then the less jagged ones that grow facing down. 5. 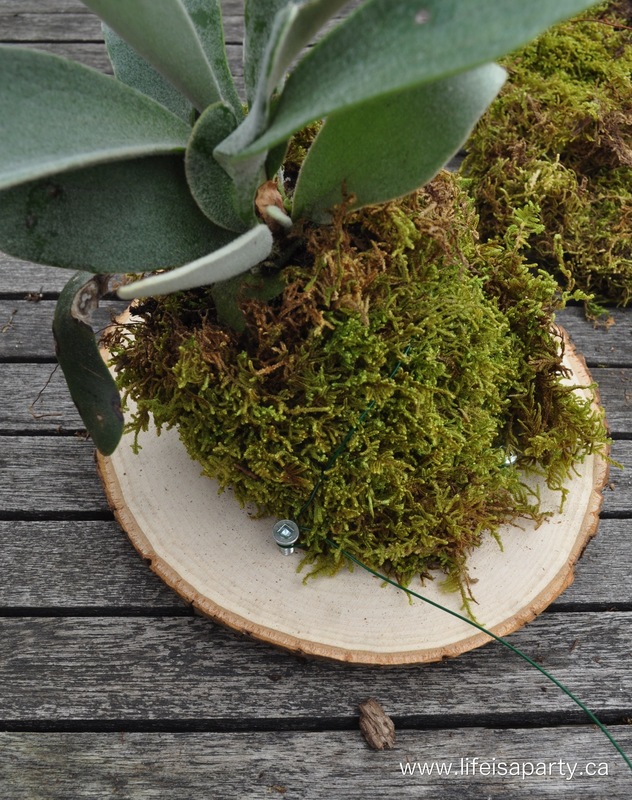 Wrap the roots in moss, including the back of the plant that will be right against the wooden tree slice. 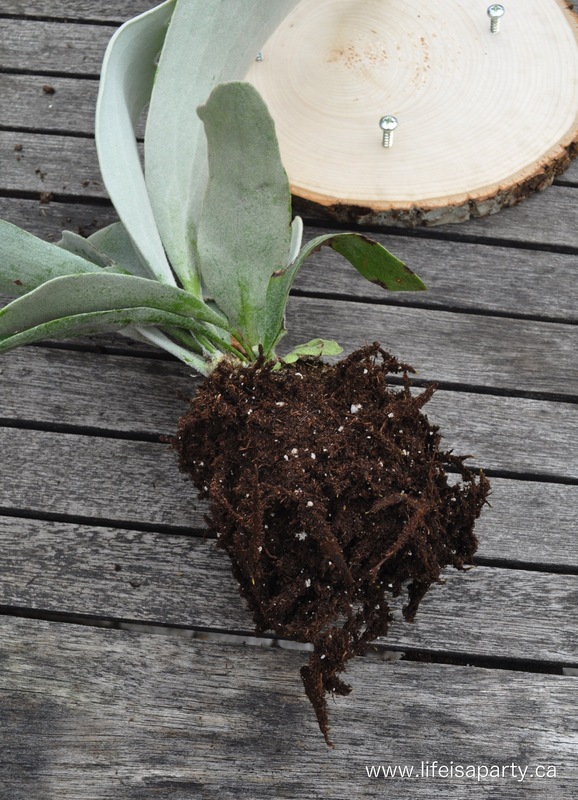 Then set the plant in place against the wooden tree slice and use wire to tightly attach the plant to the backing, wrapping it around the screws to secure it. 6. 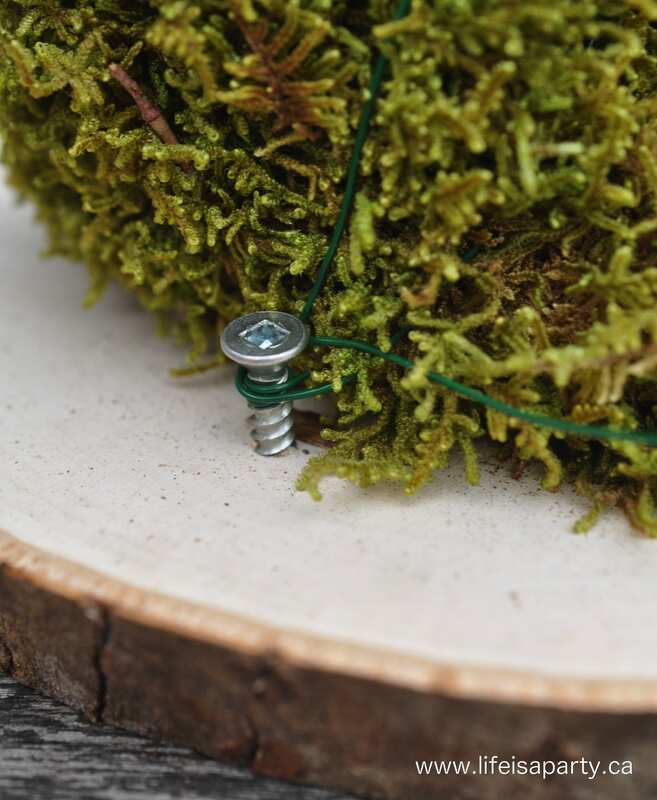 Use a little extra moss to cover the screws. 7. To water the fern, it’s recommended that you take the fern down and submerge it a sink or tub of luke warm water for about half and hour and then let it drip dry awhile before hanging it back up. I’m really pleased with mine. This is the first time I’ve tried to grow them, and I’m not sure how easy they are to keep alive. Mine here inexpensive -around $7 each, so they weren’t a huge investment -comparable to cut flowers I thought. I’ll try my best to keep them alive. 😉 I love the way they look, especially all grouped together. 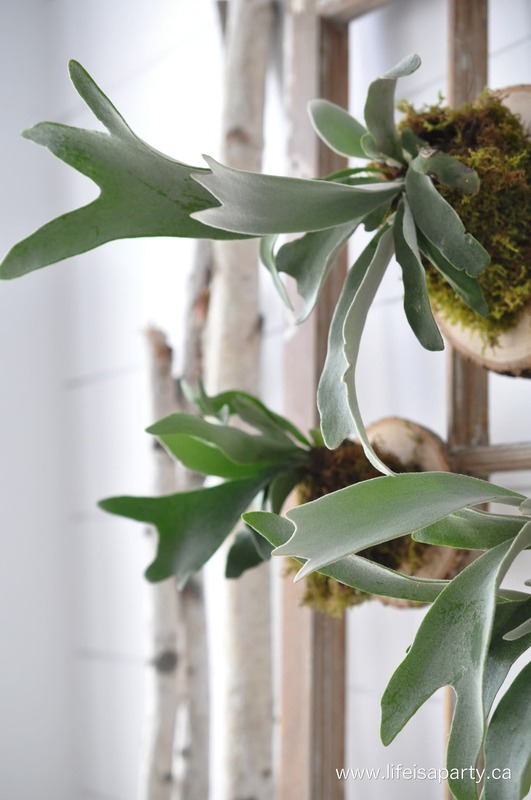 With easy Mounted Stag Horn Ferns, life really is a party.